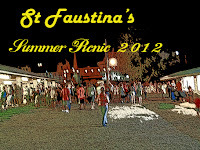 June 29, 5:00 pm started the St. Fustina's summer picnic at Holy Child Picnic grounds in New Port Township. 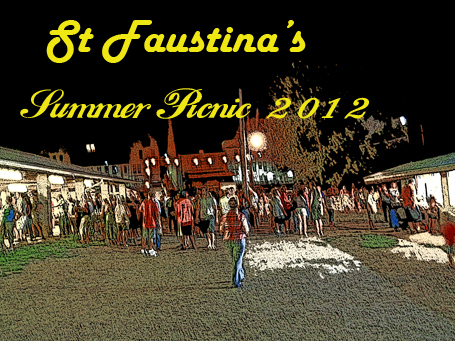 The infamous St. Fuastina's Potato pancakes were just to good too wait for. Ticket sales started promptly at 5:00 pm when I could wait no longer. Lines, even then started early, but the help was prepared and moved quickly. The pancakes, fresh out of the friers where of course too hot to eat. So, with great anticipation, I waited diligently until I could take the first heavenly bite. Of course there was all the usual games, food, music and social gathering. The younger people were happy to man the games geared for the younger crowd. Channel 16 came out to visit and report! And last but not least, the music by Stealing Neil was a band on the local circuit followed by a younger crowd. Myself being of somewhat advancing years, had not heard of them and did not know all their music. However, I must say I was impressed. A five piece band comprised of drums, bass, rhythm and lead guitar and a lead vocalist had a clean sound. You could hear each instrument that was played well. Vocals and harmony for the most part where well done. Under the pavilion the hard concrete floor and wooden roof made for a poor acoustic venue. In spite of that, it was nice to hear real music not just noise garbled up in wall of over amplified sound. In my opinion, I think they have potential and wish them well. 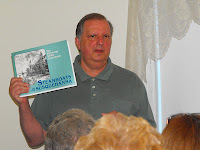 On May 31st 7:00pm guest speaker Charles Patrillo Historian and author gave a slide presentation on steamboats on the Susquehanna. Charles explained how, in the mid 1800's, transportation systems evolved in the Wyoming Valley. Charles explains that In the pre-railroad days transportation for both people and freight was necessary. Our coal rich region also created the need to move the coal. Charles illustrated in slides of drawings and photos early disposable coal barges that could carry up to 180 tons of coal down the Susquehanna River to towns below. When the barges reached their destination, they were dismantled and the operators would hike back to the the Wyoming valley to prepare another load. In the pre-trolley days canal systems were created by damming the Susquehanna, thus creating lakes and a supply source of water for the canals. Canal cars would be pulled by mules to their destination. Remnants of such systems are still around today and are visible right here in the Nanticoke, West Nanticoke and Hanover township areas. In spite of the river being polluted with both mining waste water and sanitary sewage, beaches and bath houses existed along the Susquehanna and the river was used for recreational purposes. Steamboat ferries, although short lived, did exist here in the Nanticoke, Wilkes-barre, Pittston areas. Both types of ferries with rear paddle and side wheel construction carried passengers up and down the Susquehanna. 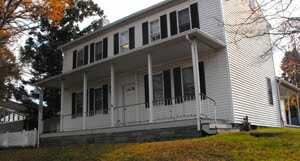 Stations existed in West Nanticoke and Wilkes-Barre near the Market Street Bridge. Although this short and probably inaccurate synopsis of the presentation does not do justice to Charles' informative and fascinating presentation, it does highlight the key topics. Description: A brief history of the area’s historical photographers. Description: A history of the valley’s unique experience with steamboats on the river between 1825 and 1902, with 37 photographs and illustrations.